First, EMILY’s List has endorsed Joseline Peña-Melnyk for the open Fourth Congressional District. EMILY’s List supports pro-choice Democratic women for elected office in federal and gubernatorial races. It has already weighed in strongly in the U.S. Senate race with a $1 million ad buy for Donna Edwards. It will be interesting to see the level of resources committed in the Fourth. Montgomery County is and will continue to be a great place for education as long as we keep our focus on classroom instruction. We should never forget that we are here to help all students achieve. Shebra wants the education community–students, parents, teachers and administrators–to excel. The education community excels with the closing of “opportunity gaps” and the expansion of “education opportunities”. Students excel when they are inspired by dynamic teachers. Parents and teachers excel by listening and working together. All excel with the hiring of and the retention of visionary administrators who view education through a lens beneficial to students, common to parents, compelling to teachers with a singular goal of making a Montgomery County education, the very best it can be. Shebra has done and continues to do the work needed to advance the education community. She has served in a number of capacities within the educational community. In addition to her work with the local schools, Shebra serves in the Children’s Ministry at her church and is actively involved with Girl Scouts of America. Shebra earned her Bachelors of Business Administration degree in Economics and Finance. Though there is a residency requirement, all county voters will be able to participate in this election. Evans had the support of the Montgomery County Education Association (MCEA) in her previous bid, which she lost narrowly to Jill Ortman-Fouse. As former MCEA President Bonnie Cullison tweeted her enthusiastic support, my guess is she will again. Twenty-eight percent of voters remain undecided. The margin of error is +/- 4.4 percent, which means that the true values should be within that range in 19 out of 20 polls. Raskin enjoys a 5:1 favorable: unfavorable rating, compared to 2:1 for Matthews, just under 2:1 for Sol Gutierrez, 1.5:1 for Barve, while the other candidates are unknown to voters. According to the press release, Raskin leads Matthews by 43 percent in LD 20, which he now represents in the State Senate. He also leads Gutiérrez by 21 points in LD 18. This is essentially a pre-campaign poll, as no commercials have been aired on TV. Little in the way of direct mail has been sent, though I’ve seen one well-done lit piece for former television broadcaster and Marriott Exec Kathleen Matthews. Right now, it looks as if the race is shaping up largely as most expect with Raskin and Matthews in the lead but neither near being able to claim that they have the nomination locked down. Matthews will likely have the edge in money but Raskin has a strong pre-existing base of supporters and volunteers. Del. Ana Sol Gutiérrez benefits from her name recognition due her long service on the School Board and a delegate in LD 18. Right now, she looks like a solid bet for third place but will need to raise substantial sums of money or grassroots support to surprise the early frontrunners. Del. Kumar Barve’s poor showing may surprise. It reflects that he has lower name recognition than the other state legislators in the race because his district–LD 17–is split between CD 8 and CD 6, so fewer voters have seen his name on the ballot. The other candidates are unknowns. They are likely to remain so unless they can raise money and attract volunteers to assist their campaigns. They also need to win support from people who can validate their message and signal to voters that they merit consideration and deserve a vote. Finally, as always, take campaign polls with a healthy dollop of salt. Inevitably, they focus on the cream rather than the lemons for their campaign. Moreover, it’s early, so most voters probably do not have fixed opinions. I am supporting Jamie Raskin’s campaign–not exactly shocking news as he is my colleague at American University. Beyond his generally active and effective work as a state senator, I appreciate his hard work for marriage equality. Jamie will be an excellent advocate for the Eighth and liberal values in the U.S. House. I will still call it as I see it here but thought I should mention it. Rep. Dutch Ruppersberger (D-2) did not cast a vote on the legislation. The other five Democrats in the Maryland delegation voted no, while the sole Republican voted in favor. Money talks and people are talking about money. That’s the vibe in CD8, which could turn out to be the most expensive congressional race in Maryland history. Bethesda Magazine’s Lou Peck and the Washington Post’s Bill Turque have written about the overall numbers and individual donors in the race. Today, I dig deep into the data to reveal more details of the Democratic candidates’ fundraising. First, the top-line numbers through the third quarter reported by Kathleen Matthews, Senator Jamie Raskin (D-20), Delegate Kumar Barve (D-17), Will Jawando, Delegate Ana Sol Gutierrez (D-18), David Anderson and former Montgomery County Council Member Valerie Ervin (who has withdrawn). Much of this has already been reported and it shows Matthews first, Raskin a close second and Barve third. With almost $3 million raised and more than two quarters to go, this race looks like a record breaker. Unlike state and county contributions, federal contributions must be designated for the primary or the general. Among primary contributions, Matthews’ lead over Raskin grows slightly. Burn rate is the percentage of money raised that has already been spent. Matthews’ burn rate (16%) is far lower than Raskin’s (25%) or Barve’s (35%). That reflects her strategy of saving up for television. Matthews leads in big contributions. Her average individual contribution is nearly twice the amount of the rest of the field. Almost half of her fundraising has come from maximum individual contributions of $2,700 each. So far, Matthews has received more maximum checks than the rest of the field combined. While Matthews has raised the most money, Raskin has a big edge in money raised in Maryland. 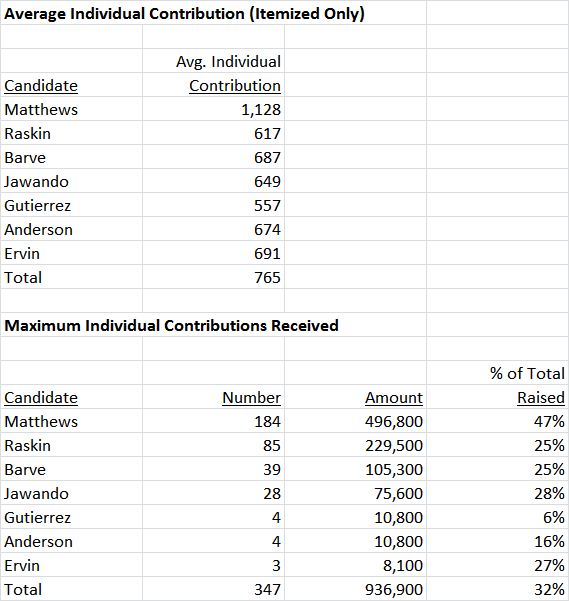 In-state contributions have accounted for half of Raskin’s total, much higher than Matthews’ 23%. Barve’s in-state 45% ranks second, though he has raised less than half of Raskin’s total in Maryland. 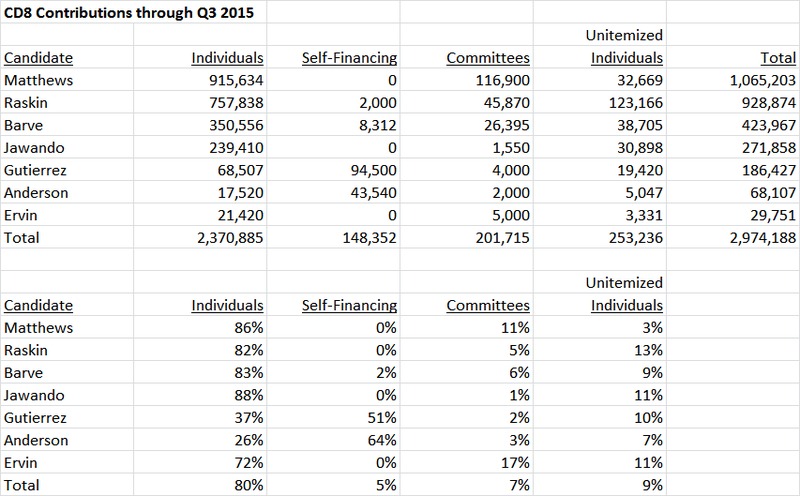 Here’s a look at fundraising from individuals in selected communities. The top seven locations are the largest population centers in CD8. Matthews leads in Chevy Chase and (narrowly) in Potomac, but Raskin has the lead in most other places. The bottom seven locations are major sources of contributions outside CD8 and Matthews leads everywhere (including in D.C.). Interestingly, Matthews has raised more money from New York City than from Bethesda. Also, Matthews has raised more money from Los Angeles than from Silver Spring, Takoma Park, Rockville and Kensington combined. That reflects her ability to tap into the Democratic establishment’s national donor network. Here are a few takeaways from this data. Kathleen Matthews’ campaign was predicated on blowing away the rest of the field in fundraising. That is happening with the notable exception of Senator Jamie Raskin, who has so far remained close to her. One factor that could change that is if Matthews’ wealthy supporters open a Super PAC on her behalf. Super PACs are not supposed to coordinate directly with candidate campaigns, but they can raise unlimited contributions and spend them on both positive and negative communication. One can easily imagine twenty Matthews supporters each chipping in $100,000, thereby instantaneously bringing an extra $2 million into the race for their candidate. Senator Raskin’s strategy of community organizing is paying off big-time for his fundraising. He is leading or nearly tied in fundraising in every populous CD8 community except Chevy Chase and his relatively low average contribution rate leaves plenty of room for repeat contributions. His two biggest challenges are countering Matthews’ likely appeal to women and what happens to his campaign once he has to go back to Annapolis for session next January. The other candidates are either plainly non-viable or on the verge of getting there because they have not been able to keep up in the money race. That may have been a factor behind the Sierra Club’s endorsement of Senator Raskin. Delegate Barve is the Chair of the House Environment and Transportation Committee and that gives him enormous ability to shape state environmental legislation. He has been a serious player on a wide range of environmental issues that long predates Senator Raskin’s service in the General Assembly. The Sierra Club faced a tough choice between the two candidates from the perspective of policy and record, but they chose to jump in for Raskin. That’s not a knock on Barve, but more likely a judgment that Raskin is a stronger choice to take on Matthews. If more progressive groups make that kind of decision, the race will consolidate into a two-person contest between Matthews and Raskin. And if that happens, here is the key question that will determine who wins. What will matter more? Senator Raskin’s large, enthusiastic and growing grassroots network? Or Kathleen Matthews’ fundraising prowess, media skills and membership in the electorate’s largest sub-component, white women? Your guess is as good as mine! It’s Joel. I’m excited to let you, my friends, and family know first – I’m running for Congress to represent Maryland’s 8th Congressional District! My wife Nilmini and I are proud to call the 8th our home. It’s where we started our family, and we now have the privilege of raising our three beautiful daughters here. I’m joining this race because this Congressional District needs someone to represent it who has strong progressive values and a proven track record of getting things done. That’s me. I’ve fought for these values my entire career – from my time in the Peace Corps to my work at J Street, the Ploughshares Fund, and in the Obama Administration at the State Department. Help us send an effective progressive voice to Washington here. It’s time to elect leaders who have the courage to confront our nation’s challenges. And that’s why I’m running. I’ll provide Maryland’s 8th District with the kind of unapologetic, effective, and progressive leadership that it deserves in Congress. I have a track record of success in taking on tough challenges and will do that again in Congress. And I won’t stop until we win! Support our campaign for effective progressive values. Donate now. P.S. – Please share this email, visit our website, like us on Facebook, and follow us on Twitter. Encourage your friends, family and colleagues to be a part of this important campaign. Over the past two weeks, I’ve heard from many of you – my friends, neighbors and supporters who have urged me to consider running for office. It’s a humbling experience. I’m truly grateful for the confidence that you have in me. I decided that I would run for office once again only if I believed in my heart that I still had something to give back to our community – the community where I’ve raised my children and dedicated my life to public service. After serious reflection, prayer and discussion with my wife Karmen and our three children, we are very excited to announce my candidacy for Maryland’s Fourth Congressional District. For my entire adult life, beginning with the years that I served on active military duty with the 3rd Infantry Division in Germany, I’ve gotten up and out of bed every day ready to serve my neighbors and our nation. From Germany, to a tour of duty in Iraq, to serving two-terms as a State Delegate representing Prince George’s County, to fighting every day for eight years as your Lieutenant Governor, I’ve seen the struggles, challenges, dreams and aspirations that are shared by families throughout Maryland and the 4th Congressional District. The stakes are high in Washington, but they’re even higher for hard-working families right here in Prince George’s and Anne Arundel Counties. The dreams of owning a home, and the reality of declining home values, loss of equity and foreclosures; the aspirations of going to college, and the struggles of oppressive student loan debt; the hope of one day retiring comfortably, and the worry that Social Security might not be there when you do; the positive news of post-recession job growth, and the despair of the growing wealth gap and need for small, women and minority owned businesses to access the billions of dollars of spending at the federal level to grow our local economy and jobs; the desire to live and raise a family in a safe neighborhood, and the disturbing fact that too many young black and Latino men fear that they cannot freely walk the streets without profiling and excessive force by law enforcement. Families in the 4th District have been fortunate to have a leader like Donna Edwards fighting for them every day. With your support, I’ll continue that fight. For the past 16 years, I’ve had the opportunity to work for you while serving in public office. As a two-term State Delegate working throughout neighborhoods from Suitland to Lake Arbor, and during my eight years as your Lieutenant Governor working with communities from Laurel to Oxon Hill and throughout Anne Arundel County, we’ve worked tirelessly to improve our schools, reduce crime, expand access to healthcare, and create jobs. But our work is far from done. Together, we’ll fight for every family, regardless of where you live and where you’re from, by ensuring economic security for all. Under President Obama’s leadership, we’ve made great progress, but it’s not enough until everyone who is willing to work hard can find a good job with a family-supporting wage. Our work continues until each of us has access to affordable housing and are protected against foreclosure, and our seniors can retire with the peace of mind that Social Security benefits will be protected and their pensions won’t be raided. Together, we’ll make sure that every child, regardless of where you live and where you’re from, gets a world-class education. We’ll get it done by establishing universal pre-kindergarten, delivering on President Obama’s call for free community college and providing additional college scholarships, grants, and loans. We will eliminate the achievement gap in education. Together, we’ll ensure our national security and safety in every neighborhood. We’ll provide the resources needed to ensure that our nation is strong and secure against foreign threats, while also providing our communities with the support needed to reduce crime with community-based and community-involved law enforcement strategies. I’m running to represent you because I believe in a future where everyone has the opportunity to succeed, not just the privileged few. I know this isn’t going to be easy, but nothing worth fighting for ever is. Our best days are still ahead of us. I’m energized to continue the conversation with folks like you about how we can work together to create a better future for our families, our small businesses, our schools and all of our neighborhoods. Thank you for your support and I hope you’ll stay in touch by following me on Facebook and Twitter. The Washington Post is reporting that former Lt. Gov. 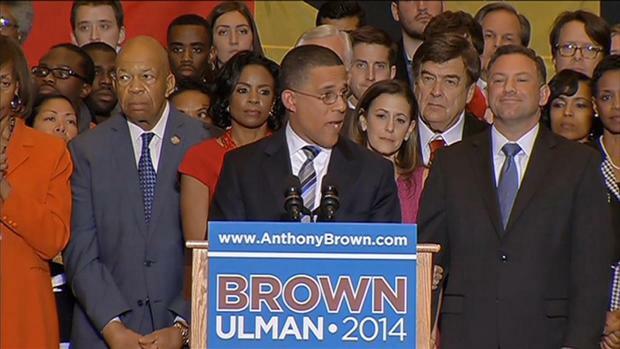 Anthony Brown will announce his candidacy for the Fourth Congressional District tomorrow. Brown performed well in Prince George’s last year–gaining 76.7% of the vote in the primary and 84.2% in the general. But turnout was low in both contests. Moreover, he will face a very different field that will include other African-American and Prince George’s candidates, including former State’s Attorney Glenn Ivey. Brown undoubtedly has a great fundraising network after last year’s election. But it remains unclear how willing they will be to open their pockets again after last November’s stunning loss and how voters see Brown at this point. He will also have to retool his message for a federal rather than state election. Still, many may admire a man who picks himself up after a big loss. And he has an admirable personal story of having served in Iraq while a member of the House of Delegates. Like President Obama, he is a Harvard Law School graduate.